On this day in 1882  at Platt’s Hall, Oscar Wilde delivered the ninth of ten consecutive lectures in California, and his fourth and last in San Francisco. As San Francisco was the only city in America where Wilde lectured four times, he needed an additional lecture to add to the three he was already giving, which were: The English Renaissance, its successor The Decorative Arts, and The House Beautiful. [See Lecture Titles for the development of Wilde’s lecture topics]. 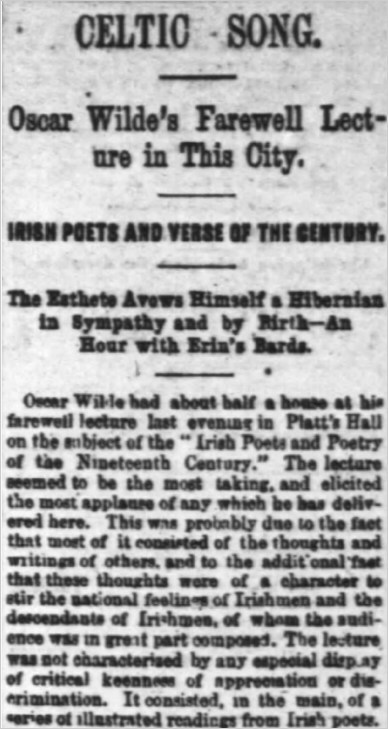 Wilde chose as his subject Irish Poets and Poetry of the Nineteenth Century (referred to in some texts as The Irish Poets of ’48), an idea he had hinted at on St.Patrick’s Day in St.Paul, where he made a rare expression of Irish nationalist sentiment.